Methods for Studying Human Cerebellar Structure and Function is a 2-day workshop for investigators with an interest in applying modern anatomical and physiological methods to the study of human cerebellar function. It is a satellite event of the 2011 Society for Neuroscience Meeting in Washington, DC. While it has long been known that the cerebellum is involved in a broad range of sensorimotor and cognitive processes, it is only recently that technical advances in neuroimaging and neurophysiological methods have allowed investigation of these phenomena in humans. This workshop will serve to bring together basic and clinical neuroscientists interested in human cerebellar structure/function relationships to share their experience relevant to the technical aspects of cerebellar investigation. Presentations will cover the principal methods currently in use to study human cerebellar function, including: (1) magnetic resonance imaging (MRI) of cerebellar structure, (2) transcranial magnetic stimulation as a neurodisruptive probe of cerebellar function, (3) functional MRI connectivity studies of cortico-cerebellar loop organization, (4) task-related functional MRI studies of cerebellar function, (5) MRI meta-analysis approaches to cerebellar function, and (6) focal and neurodegenerative lesion analysis of cerebellar function. On the first day of the workshop, a lunch-time reception and poster session will allow participants to share their recent findings and will provide an opportunity to discuss opportunities for future efforts. 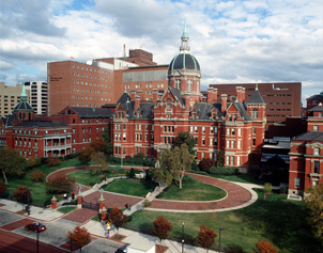 The course will be held on the Johns Hopkins School of Medicine campus in Baltimore, Maryland from November 10-11, 2011. Directions to the classroom in the School of Nursing Building can be found here. Register for the workshop here. Registration at the main SfN meeting in Washington is not required to attend this workshop. The standard fee for the 2-day program is US$300. Reduced rates for JHU investigators, undergraduate, graduate or medical students and research assistants will be available until Oct. 26th. After that date, all registrants will be charged the standard fee of US$300. Make payment using PAYPAL here. The workshop organizers are Cherie Marvel, Jacinda Dariotis and Thomas Zeffiro. During the lunch break on Thursday and Friday we are arranging catered poster receptions to allow participants to share their current work. Although there is limited display space for posters in the meeting area, we will accommodate as many as possible. The registration process must be completed at the time of poster submission. To submit after your registration is already completed, please mail an abstract in SfN format to cerebellum@neurometrika.org. Please include your last name in the file name. SFN-accepted posters may be presented, as well as posters from outside conferences in other formats. SFN posters are generally 3' H x 4' W (.9 m x 1.2 m). Note that for this symposium, poster boards will measure 6' H x 6' W (1.8 m x 1.8 m). This could be a good opportunity for you to share the findings you will be presenting at the SfN meeting the following week.